Thinking of taking up the sport (diving). 48y male with Diabetes Mellitus, controlled with diet & metformin. Is it OK to dive with this condition? Probably yes. There are many issues with the diabetic diver to consider before they are allowed into the deep, but on the whole a well controlled diabetic who is bright enough to understand how to run a sugar high before exercise, when they are getting a low sugar and the implications of this is often considered fit to dive. A dive medical is needed of course first where the doc will make a call on your status, but from my experience many insulin controlled diabetics are OK to dive. Your sort is often considered more stable and so if you have a real understanding of your problem and its implications you should be fine. There is a lot more to be said about issues of who to dive with as a buddy, what your maximum depth would be, how often to test your sugars before and after diving etc. I wont go into them now but a doctor in Oxford specialises in your problem and I suggest you see him. Mail me for details. One week after returning from a diving trip to the Red Sea I was diagnosed with insulin-dependent diabetes. In the hospital I was told by the doctor that I would have to stop all activities such as scuba-diving and sky-diving. That was six months ago. I have since spoken with other divers who have assured me that they have known 'diabetic divers' and read articles about divers with diabetes. As I have learnt to control my diabetes and lead a normal life, I am looking forward to my next diving holiday. I have made some inquiries and have been told that the only thing which I need to do is get a letter from my GP stating that I have not had any major 'hypos' for insurance purposes. Is there any special bodies I could speak to, or any special requirements I should be aware of which may affect my diving/diabetes. I was also told that some countries do not allow people with diabetes to dive. Is this true? The good news for you is that the first doc got it wrong and your mates got it right. Being a diabetic, whether insulin or non-insulin dependent is no bar to diving. What is a bar, though is being a hopeless diabetic with no idea of control, how to run a sugar a bit high before a dive, and not being able to recognise a low sugar situation. Your mates also got the fact that all you need is a cert to say you wont have a hypo slightly wrong. You need a whole lot more than that. The UKSDMC, a committee of doctors that pronounce on medical problems and diving have quite a good set of rules and advice on diabetes and diving. Check out their website and find out what they say. But the bottom line is that if you have good sugar control, found out by a blood test called an HBA1C, are responsible enough and can dive with a buddy with at least Rescue Diver skills then go and see a diving doc for assessment. You can be diving sooner than you think. I can’t comment on the sky diving but if you feel odd just pull that cord and hope you miss the power lines. I am a 50 year old female, insulin requiring diabetic, with hypertension. I take Metformin 850mg 3 times daily, Insulin:Novorapid with meals and Levemir at night, Simvastatin 20mg daily and Quinapril 40mg daily. My medical was due for renewal last October but I haven't come back because I haven't been diving as I am unwell due to problems with the diabetes and my joints (polyarthralgia of unknown origin). At the moment there is point in coming for a medical as I know I am not fit enough to dive. It's been a long time since I've been well enough (7 months) and I am just beginning to wonder if I will ever be able to dive again? What do you think please? My question really relates to the diabetes that I have had for 10 years. I started taking insulin 2 years ago. Until last year I had no side-effects from the diabetes but now I have developed symmetrical neuropathy (hands and feet) and problems with my eyesight. I have medium proliferative retinopathy with macular oedema in one eye. Apparently the retina is detaching due to extra vessels - I am waiting to see a specialist at hospital to discuss. In the other eye I have spots on the retina. You always said that I was OK to dive so long as I had no side effects from the diabetes. Should I give up with the side effects that I now have? Halle Berry, Sharon Stone, Scotty from Star Trek… the list of famous diabetics is long and fruity. For the benefit of the curious, a quick run-through the chequered history of diabetic divers would be a good start here. An incident of DCI involving a diabetic diver in the mid 70’s prompted BSAC to ban all divers with the condition (apart from those controlled by diet alone). However, when the case was re-examined in the early 90’s, it was found that several factors not related to diabetes (including a PFO) contributed to the accident. Around the same time, a survey of diabetics who continued to dive despite the ban found that none reported hypoglycaemic (low blood sugar) attacks whilst diving. So BSAC began to re-admit diabetics as members in 1992, as long as certain strict medical criteria were met. The subject of diving with diabetes could fill a whole book but in a nutshell, the greatest potential risk to diabetic divers is having a hypoglycaemic episode (a “hypo”) whilst under water. A severe attack can result in weakness, loss of consciousness or fitting – all potentially catastrophic in the inky blackness. The stresses of diving (hard finning, high work of breathing etc.) can use up a lot of blood sugar and make hypos very unpredictable even in well controlled diabetics. Also the early symptoms of a hypo (disorientation, euphoria, nervousness) can easily be confused with narcosis. This is why most authorities recommend a depth restriction of 25-30 metres for a diabetic diver – to minimise possible masking of hypo symptoms. Secondary complications of diabetes are generally indicative of severe and progressive disease. These can affect any organ of the body, but of most importance diving-wise are the effects on blood vessels. Furring up of the arteries occurs much earlier in diabetics, leading to an increased risk of high blood pressure and heart attack. For the same reason, diabetics can develop early cramping in the legs, with poor exercise tolerance. The eyes, kidneys and nerves are also affected, and function less well. Although this does not directly affect diving ability, it is a sign that the illness is progressing. In your case I think the stage has been reached where it may be best to consider hanging up the fins and looking back at all the enjoyable memories you’ve accumulated. I am an unfit, 50 year old, diabetic of 30years, who would like to go scuba diving. I did contact a doctor who said that he thought I should be satisfied with snorkelling but he did say to contact you for a second opinion. I have joined a gym this week and also have started to swim once a week, as I have reached that age where I now need to get off my backside and do something, my urge to scuba dive will only be my holiday time not all the time as I am not keen on cold water. I think you get top marks for honesty. Well done. There are unfit diabetic divers of your age out there, so you would not be alone. But my respectable bow-tied sensible doc opinion, is that as a diabetic, if you are unfit then you risk getting a sugar low at depth, which can be fatal. So fitten up, as they say, and swimming is perfect for you. Once you can do, say 20 lengths without getting any problems with your sugar, then see a dive doc for your assessment. They will look at how good your control is, told by a certain blood tests called an HBA1C. If this is normal, and you have a good understanding of your diabetes, and no physical manifestations of advanced diabetes, e.g. poor blood supply to your feet, then there's a good chance you will be passed as fit. Take that honest advice from this 28 year old, loaded, handsome, super fit love machine of a doc. "I confirm as Mr S's GP, that he suffers from diabetes and hypertension.Having considered current guidelines, I feel there is no reason why he should not be fit for Scuba diving." I took the letter with me, made known my condition to Camel Divers and they took me to the local dive doctor to get his authority to proceed. To my amazement he said that as I take medication for diabetes he would not allow me to take the Open Water Course. He allowed me to go on introductory dives and I did 2 of these, to depths of 6 and 7 metres without any adverse effect. Obviously I was somewhat distraught as I could not become certified, something I am desperate to do. My girlfriend, who accompanied me completed the course successfully which really rubbed salt in the wound! However while she was on the course I met a few of the instructors and was introduced to Paul Toomer of Diving Leisure London. Having explained my predicament to Paul he felt sure that the Egyptian doctor was being ultra conservative in his approach and Paul suggested I contact you. Please believe me, I have no desire to put my life at risk and do not want someone to rubber stamp an authority to do something that could be dangerous to me. However I believe my condition should be kept in perspective - I am pleased that I know of it and my medication will help further. Surely that puts me in a better position than the hundreds of people that have open water certification and are unaware of the fact that they have diabetes? Please let me know what you can do to assist. Wise advice, from the Toominator there. And, as it was him that got my kid to say "muppets" to those more cerebrally challenged than ourselves, it seems we can extend that term to those who would ruin your hols. Here's where it all went wrong. Your GP is really extending his remit, if he thinks he can pass you as fit to dive, unless he is a dive doctor in the first place, which I doubt. Camel, were completely in the right to ask you to see their local docs for verification of this cert. In fact I am impressed with what they did there. On ya, Camel posse. But the Sharm docs should well know that a fit, well controlled diabetic is allowed to dive. It's what we call a "relative contraindication", not an absolute one. I.e. it depends on how well you manage your problem, how bad your problem is and is there a risk that you will have a diabetic low sugar attack at depth. Your high BP is easily assessed with an ECG and a BP reading. So all you needed was the doc to look at your sugar control, have a chat with you to get a feel for your problem, a quick blood test, and you could have been fine. Next time, go straight to a dive doc, not your GP, and a dive doc who will take time to be available to Camel to talk through your issues so you can do what you paid to do. Spread the word. I, am a 47 year old male and been diving for three and a half years, 9 months ago I was diagnosed with type 2 diabetes and in this time I have been controlling this with diet and 75mg Aspirin once a day, I have continued to dive but keeping within limits no deeper than 30 meters but usually most of the dives I do are between 15 to 25 meter range and always using Nitrox, I regularly test my blood sugar levels after every dive they remain between 4-6 and I have never experienced any other problems. At a recent review my long term blood test showed a slight increase in blood sugar from 7.1 to 7.6 although the rest of my blood test showed my liver and kidney function ok, blood pressure normal no protein or ketones present in my urine, my weight is correct for my height, the doctor has now put me on medication this is 500mg Metformin twice daily. Can you advise me of any complications with diving and this medication or is there any advice you can give me, should I have a medical to prove fitness to dive and what type do you suggest. I would be grateful for any information you can give me as I, am due to go to Sharm at the end of the month. You do need to have a medical before you dive again. Thats the rules. But it seems as you are experienced and know what you are doing with both the diving and diabetes you will pass. The main issue for a diabetic diver is about getting a low sugar attack at depth. These are called hypo's, and can kill if you got one on a dive. There are also depth restrictions for diabetics so you do not narc and miss a hypo happening. 25 metres is the generally accepted max depth. As you are tablet controlled your sugar ought to be a bit more stable then an insulin dependent so I see no problem in you passing a medical. But your dive insurance company will demand it before you go to Sharm. I have been diving since 1988 and have only had to break from diving whilst carrying my twins. During my pregnancy 4 years ago I experienced gestational diabetes and this completely cleared the day I gave birth to my boys. However I was warned that the diabetes could return. Well, unfortunately it appears to have done just that. Last week I had a blood test and the result was high glucose. However the only symptoms that pointed me towards having diabetes were gum problems, athlete's foot and thrush! I had no other symptoms. I'm going to be 40 in August. My doctor has recommended that I take metformin and I have an appointment to see a diabetic nurse. What I am most concerned about is not being able to dive! I've got many trips planned this year. Please can you advise me regarding diving on metformin and with diabetes, I am feeling very 'gutted' at the moment! There are many different types of diabetes, but it’s still a mystery as to why being up the duff would bring it on. Anywhere from 3 to 10% of pregnancies are affected. The currently fashionable explanation is that pregnancy hormones interfere with the action of insulin, leading to insulin resistance and a similar condition to type 2 diabetes. Once the pregnancy resolves then often the diabetes does too, but in some cases the condition becomes lifelong. Metformin is one of the mainstays of oral treatment for diabetes of any type. It’s a very safe drug that lowers blood sugar but at recommended doses is very unlikely to cause hypo’s. It doesn’t cause weight gain, and handily also lowers cholesterol and triglyceride levels too. If you’re feeling ‘gutted’ at the moment, metformin won’t help: it tends to cause a bit of extra tummy gas and loosen the bowels for a while, but the gut will get used to it with time. So once you’re used to the lifestyle changes and medication that will be coming your way, you should be able to make those dive trips you’ve planned. With my work I get the opportunity to have a health screen every 2 years, and I had one last week. I got the usual admonishment for being overweight (my diet is full of fast food, I'll admit), but on the blood tests they said I had "impaired fasting glycaemia". As far as I understand this is not diabetes, but an early warning sign that I might develop it. I'm a fair weather diver who just does a few dives on holiday, nothing too adventurous or deep. Will this have any implications for my diving? There’s a sort of no-man’s land in blood sugar levels, between the upper limit of normal (usually 6.0) and the diagnostic value for diabetes (usually 7.0). Anyone who’s in this range is classified as having impaired fasting glycaemia, and 1-2% of them per year will progress to diabetes. You should have had an oral glucose tolerance test, or be due one, which is used to exclude diabetes, but even if this is normal, you’re still at higher risk of heart disease. Lifestyle changes are vital if you want to stave off full blown diabetes – less chips ‘n’ gravy and some old fashioned exercise would help to sort the weight out. You need a dive medical to assess your physical fitness for diving and it’s probable you’ll need an exercise ECG (some pounding on a treadmill whilst wired up) to make sure your heart’s up to it. Even shallow submersion causes a fairly significant increase in the heart’s workload, so we need to know it’s got the capacity to cope. I am now a 50 year old female, insulin-requiring diabetic, with high blood pressure. I take metformin 3 times daily, inject insulin with meals and at night, and take simvastatin for high cholesterol and quinapril for the blood pressure. My medical was due for renewal last October but I haven't come back because I haven't been diving as I am unwell due to problems with the diabetes. At the moment there is no point in coming for a medical as I know I am not fit enough to dive. My question really relates to the diabetes that I have had for 10 years. I started taking insulin 2 years ago. Until last year I had no side-effects from the diabetes but now I have developed symmetrical neuropathy (hands and feet), a stubborn ulcer on my heel that won't heal, and problems with my eyesight. I have medium proliferative retinopathy with macular oedema in one eye. Apparently the retina is detaching due to extra vessels. Should I give up with the side effects that I now have? The short answer is yes, I’m afraid. No matter how good their sugar control is, diabetics will over the years suffer from damage to blood vessels large and small, and this will inevitably lead to the types of complications you now have. It’s generally agreed that once this occurs, diving should stop. The sensory disturbances in your extremities could lead to difficulties on a boat and confusion with DCI symptoms. Another potential problem is “silent ischaemia”; diabetics are at risk of heart disease and often don’t get the classic warning signs of chest tightness before a full-blown heart attack. Incidentally, has hyperbaric oxygen been considered for your non-healing ulcer? Studies have shown that for certain types of ulcer, hyperbaric oxygen can speed up healing and reduce amputation rates. It’s one of the many other uses for a decompression chamber, so mention it to your supervising doctors and give us a call if we can help. Last year at my hospital review my diabetes consultant talked to me about an insulin pump, which is supposed to be better than injecting myself several times a day. I'm still thinking about it, and the main reason is because I'm an avid diver and don't know whether diving with an insulin pump is possible. Do you know anyone who's used a pump underwater, and is it safe? Although invented in the 1960’s, insulin pumps have only been approved for use relatively recently. The idea is to try to mimic the way a normal person’s body would produce insulin, so there is a basal rate of insulin delivered continuously, with bolus doses at mealtimes. The pump is about the size of an audio cassette (remember those? ), with a reservoir of insulin inside, which it delivers via thin tubing to the infusion site under the skin. Most newer pumps are “smart” and able to calculate how much insulin to give, depending on the current blood sugar and what the person is eating. The advantages of using one include tighter sugar control (therefore reducing the chance of complications), convenience and discretion, but the setup is expensive and pump malfunction or damage can be a problem. And this is the concern with diving – the pump is a mechanical device, and can fail. Most pumps have not been pressure-tested and there are several reports of them caving in at depth. So I’d suggest it’s probably safest to disconnect the pump for the duration of the dive and leave it topside. Better to run a slightly high sugar for an hour or two than risk a hypo from a wayward bolus of insulin at depth. Hi. I'm emailing you on behalf of my dive buddy. We've been diving together for 10 years or so, but he's just been diagnosed with diabetes. He's 52, and I'm sure he won't mind me saying, a little bit on the overweight side. His doctor has started him on some tablets (I don't know which ones, sorry) and he's due to have some healthy eating advice from a dietician soon. At the moment he's stopped diving, but we've got 2 trips planned abroad this year which he still wants to do. My question is, is there anything I can do, from a buddy point of view? What sort of things should I look out for? A new diabetic has a lot of information thrown at them and it takes some time to adjust and come to terms with the lifelong changes required to manage the condition. So the most important thing you can do is be supportive, and learn about the disease too. Knowing how to recognise the symptoms of low blood sugar and deal with them are key skills which could be vital if there’s an underwater incident, so it pays to plan for and rehearse these situations with your buddy. Sharing a hand signal for a hypo and having some emergency glucose in a BCD pocket are useful tips, and ensuring other staff and divers are aware of what to do if there’s an incident is important. To sum it up: like a good scout, be prepared. This is not a diving-related question, but I am a diver, so forgive me for picking your brains but I hope you can help. I'm diabetic and due to start treatment in a hyperbaric chamber for an ulcer on my heel that just won't heal. The doctors treating me have mentioned fits as a possible side effect of the treatment, which naturally worries me slightly! How common is this, and what increases the risk of it happening? Are there any early warning signs of oxygen toxicity, or ways to reduce it? Obviously I want to try anything that will help my foot but don't want to become epileptic in the process. I think I can reassure you that the risk is very, very low. Convulsions are the most dramatic end-result of central nervous system oxygen toxicity, and thankfully “doing the funky chicken” is a rarity in modern day diving and hyperbaric practice. Often a seizure will be preceded by other signs such as muscle twitches or spasms (often in the lips), anxiety, irritability, nausea or (my favourite) “a sense of impending doom” (think Private Frazer, the dour wild-eyed Scotsman in Dad’s Army). At this stage, further toxicity can be avoided simply by removing or reducing the inspired oxygen. 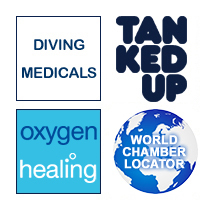 During hyperbaric treatment (for divers and non-divers alike), “air breaks” are used for precisely this reason – 5 minute periods of breathing normal air will reduce the body’s oxygen content to non-toxic levels. Clearly longer exposures to higher oxygen partial pressures will increase risk, as will exercise. Drugs that mimic the sympathetic nervous system are thought to enhance toxicity, so for this reason Sudafed and similar medications are not advisable when diving near the oxygen limit. Finally, there’s no evidence that an oxygen-related convulsion leads to epilepsy; much more evidence exists that hyperbaric oxygen will help your ulcer, so I’d encourage you to crack on with the treatment. Good luck.